Preheat oven to 375 degrees F. Spray an 8-inch x 8-inch square baking dish with cooking spray. 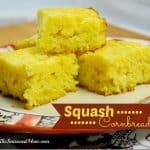 In a large bowl, mix together cornbread mix, cottage cheese, salt, and eggs. Stir in diced squash. Pour batter into prepared pan. Pour melted butter over the batter. Bake for approximately 20-25 minutes, or until golden brown and cooked through.